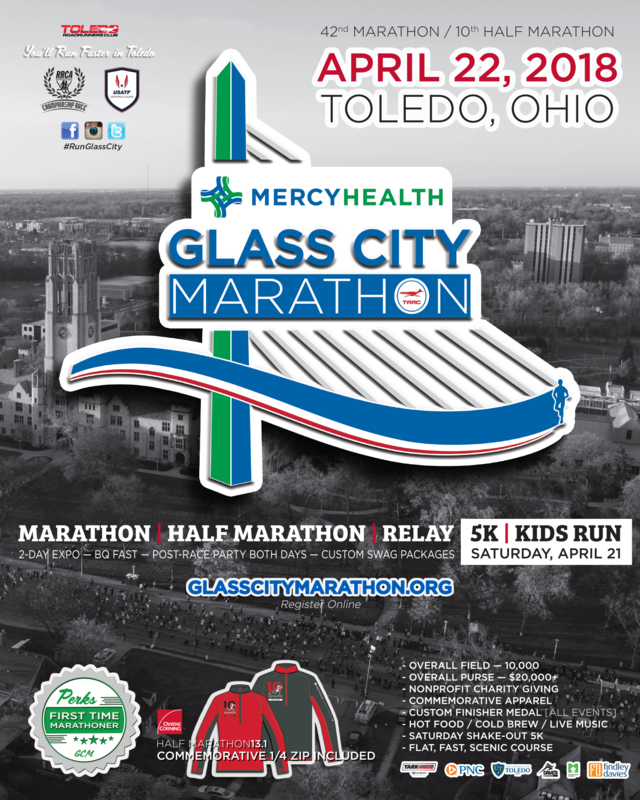 One of the fastest marathon courses in the Midwest, The Mercy Health Glass City Marathon (GCM) course will begin on Secor Road at the University of Toledo West Entrance, circle campus before heading West into beautiful Ottawa Hills. The course then leads you to the area’s finest Metropark system utilizing the University Parks bike Trail. A tour through Sylvania leads you to Olander Park, passing the statue of Sy Mah, then back down the bike trail to a short tour of the UT campus concluding with the finish in the newly renovated Glass Bowl. Events include the Mercy Health Glass City Marathon, Yark 5-person Marathon Relay, Owens Corning Half Marathon, and companion Findley Davies Kids Marathon. New this year is a complementary 5K on Saturday morning. All courses are USATF certified.